Today, when it comes to what’s under the mattress, there are a few ways to go. You can put your mattress on a wood bed with slats, or a box spring, or a wood foundation, or a metal bed frame. Metal bed frames are made in NJ and are very thick and there is no noise or squeaking. Metal Bed Frames are just one way to go. The Amish build most of our wood bed foundations, so you can be assured of the highest quality. They come in the standard 8” thick, or 3”. It all depends on how high you want to be off the ground, and how high your headboard is so you don’t take away from that. If you have a high headboard you may want an 8” foundation. If you just had a baby and want to be lower to the ground you might want a 3” foundation. If you are elderly, you want to be higher up off the ground so it’s easy to get in and out of bed. See what I mean? These wood foundations are usually built up on metal bed frames, so the mattress is off the floor 6-8 inches. Wood foundations are built for us mostly out of spruce today by the Amish. Then these solid pieces of wood are finished off at the mattress manufacturers with organic cottons and wool padding to cover all the wood. They look like box springs, but are solid wood, with slats. 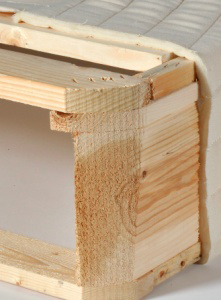 Some wood foundations have solid slats across the top, and some have dowels that move with your body. All have circulation to make the mattress breathe. If you put a mattress on solid wood, it could cause a buildup of moisture that can lead to mold. So having your mattress up on these metal bed frames will eliminate that issue. A good metal bed frame runs around $120.00. 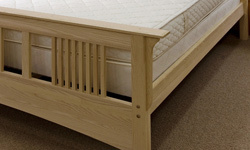 Last but not least, no matter what you purchase you should always be looking for a firmer more solid wood bed to avoid transference of motion. Imagine putting one of our high quality low or no transference of motion beds on to a cheap metal bed frame from the local guy down the block. Not only will that product fall apart quickly, but you will be out your money. 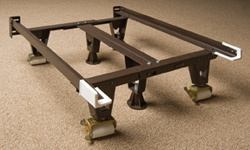 Invest your money on quality metal, or wood bed frames and it will only add up to a more restful sleep down the road. All slat wood foundations and wood beds should have a space no more than 3 inches apart in between the slats. This is adequate whether it’s a wood bed, or a wood foundation. Too much of an airspace and your mattress can go thru the slats. Choose from 2 heights: 3″,or 8”.